The annual conference for the Michigan Brewers Guild held on Jan. 10 was a record breaker in many ways for the organization, with more than 750 attendees including nearly 130 vendors in the Allied Member Trade Show. The Guild also reported 256 member breweries at the close of 2018, up from 245 at the end of 2017. Here are some highlights. 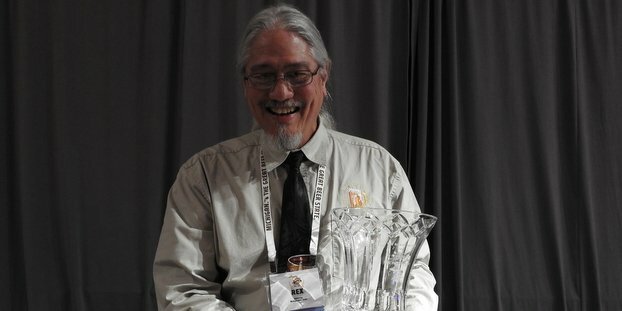 The Michigan Brewers Guild presented two key awards to industry leaders at its annual conference. Eric Briggeman of Rochester Mills Production Brewery (who served 14 years on the Guild board, including 10 years as President) was awarded with the esteemed Tom Burns Award. Steve Siciliano of Siciliano’s Market in Grand Rapids was presented with the Michigan Beer Champion Award. The Tom Burns Award is given to a person who embodies the pioneering spirit of the Michigan brewing industry. Nominees can be brewery owners or employees, can be affiliated with a beer wholesaler or beer retailer or otherwise involved in the industry. Nominees can be part of the industry now or in the past and do not need to be currently living. These two first met in 1997 when Graham (as Corporate Brewmaster) hired Briggeman to oversee production at Big Buck Brewery & Steakhouse in Auburn Hills. During his years there, he worked with other fellow brewers like Alec Mull, Bill Wamby, Marty Rapnicki, Forrest Knapp, Rockne VanMeter and Kim Schneider. In 2005, Briggeman took a Head Brewer position at Rochester Mills Beer Co., a brewpub in downtown Rochester. By 2011, the brand was growing and Rochester Mills began to distribute their beers and Briggeman moved to a new production facility in Auburn Hills to head up brewery operations. Today, he serves as Vice President of Operations for the company. The Michigan Beer Champion Award is given to a person or organization who is a partner of the industry and who continually strives to promote or protect the craft beer industry in Michigan. Nominees can be individuals, wholesalers, retailers, affiliated businesses or can be groups or organizations. Guild board member Isaac Hartman, “Ambassador of Great Beer” from New Holland Brewing Company, presented this award to Siciliano’s General Manager Sarah Derylo, niece of owners Steve and Barb Siciliano.